To lift, push the centre armrest up gradually in the direction of the arrow . To adjust the centre armrest lengthwise, move the armrest forwards or backwards as far as it will go. 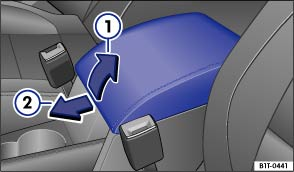 The centre armrest could obstruct the driver's arm movements which could cause accidents and severe injuries.